Becoming a medical coding and billing clerk is one of the most recommended career paths for workers disinterested in direct patient care. In fact, the U.S. News & World Report ranked it America’s #68 best job with “above average” work-life balance. Medical coding and billing clerks trade the stress of disease monitoring and invasive surgeries for detailed computer work. These health IT technicians stay behind the screen while still benefiting from a huge $7.07 trillion industry that’s forecasting 2.3 million new hires by 2025 on CNN Money. Keyboards are medical coding and billing clerks’ scalpels to dissect complex patient files for insurance classification. Their duties are administrative to accurately record diagnoses and treatments for successful reimbursement claims. Keeping patient data secure under HIPAA is also paramount since Becker Hospital Review found 5.6 million records were breached in 2017 alone. Think you have what it takes to fulfill demand for this essential health service? Here are four simple steps to quickly become a medical coding and billing clerk. Choosing a profession should always begin with ample research. Especially since Fortune found that only 51 percent of U.S. workers are satisfied in their roles. Thus, start by discovering what medical coding and billing clerks really do. Review ICD-10 code book samples to better understand the career’s technical specifics. Resource books, such as Understanding Medical Coding, can help test your interest. Perhaps join AAPC’s 175,000 members who read Healthcare Business Monthly for career tips. Other professionals can share insider’s knowledge on what medical coding and billing is like. After reading our website’s FAQs, visit Google to inquire about the job requirements. The Bureau of Labor Statistics offers salary snapshots to decide whether the average pay meets your needs. Infit Healthcare has an excellent personality quiz to determine if medical coding and billing clerk is your calling too. Congrats on selecting medical coding and billing clerk as your goal! Next comes the training part to specialize your office skills. Certificates are the fastest option for high school diploma or GED recipients to learn the ins and outs. The Institute of Education Sciences states that the number of certificates awarded has risen by 41 percent since 2013 to 969,000 per year. These short-term programs take three to 16 months to grasp the basic concepts of health IT protocol. Medical coding and billing curricula packs a punch of valuable content in just 30 credits on average. The NCES College Navigator lists over 500 colleges, both traditional and online, offering this certificate major. Great options include Carrington College, the University of South Alabama, Red Rocks Community College, Lehman College, Manor College, the University of Houston-Downtown, and Glendale Community College. Always check that your target schools hold accreditation approved by the U.S. Department of Education for sound academics. Earning a postsecondary certificate for training is very different than professional certification. Third, hopeful medical coding and billing clerks should choose an apt industry credential. More than letters after your name, this certification proves to employers you’ve met a trusted third-party associations’ qualifications. For example, the AAPC celebrates its 30th year of awarding the Certified Professional Coder title to over 105,000. The CPC program involves taking a 150-question, six-hour proctored exam costing $380. Another similar choice is Certified Professional Biller (CPB), which tests revenue cycle smarts in 200 multiple-choice questions. Likewise, the AHIMA designates Certified Coding Specialists with at least 12 months of experience. This CCS credential is available after passing a four-hour, 97-question $399 exam at Pearson VUE centers. Study using free online test prep materials for weeks instead of cramming the night before to improve your chances of success. Openings for medical coding and billing clerks on websites like Monster or Indeed typically only require a college certificate. The AAPC’s Project Extern requests just current certification for entry-level positions at its 200+ partners too. So why should you consider further education? Transferring credits toward an associate degree will open the most professional doors. The Labor Department predicts 13 percent growth by 2026 for 27,800 new health IT jobs, but competition can still be fierce. Two-year associate programs frequently give a edge for medical coding and billing jobs with greater responsibility. Therefore, you’ll be able to apply for job titles like manager or supervisor for higher pay. Currently, 175 U.S. schools house these degrees. Excellent choices include Northwestern Technical College, Keiser University, Central Maine Community College, Herzing University, Delaware County Community College, and Daytona College. The extra effort can add more in-depth patient records expertise to your LinkedIn to become a medical coding and billing clerk with upward mobility. Medical coding provides a vital link between physicians caring for patients and the health insurance companies that cover their services. Medical coders are indispensable for translating doctors’ notes and treatment plans into simplified language for reimbursement. Without the accurate work of medical coders, insurers would likely reject claims or repay too little. Therefore, recruiters in hospitals, outpatient centers, physician practices, skilled nursing facilities, clinics, and other healthcare providers need to carefully select their medical coding staff. The following are the top qualities employers seek when hiring new medical coders. Finishing a high school diploma or GED often isn’t sufficient in employers’ eyes. Post-secondary career training in medical coding is quickly becoming a requirement. Medical coders should hold at least a six-month certificate for coding and billing experience. Earning a two-year associate degree in medical coding or health information technology is preferred. Employers are also more inclined to hire medical coders who’ve passed certification competencies. Consider becoming a Certified Coding Associate through the AHIMA or Certified Professional Coder through the AAPC. Attention to detail is one of the foremost character traits required in medical coding. Assigning the wrong alphanumeric codes for a surgical procedure or laboratory test can cause significant problems for the patient and practice. Medical coders must carefully review the intricate differences between codes to select the apt one. Employers especially want medical coding staff to attend to detail while multi-tasking. Medical coders should be able to juggle various documents and reports without compromising quality. Organizational skills also play a role here since some facilities have thousands of patients. Medical coding isn’t simply a clerical job. Applicants need to demonstrate in-depth knowledge of human anatomy and physiology like healthcare practitioners. For example, knowing the difference between medical terms like periosteum and peritoneum or endocrine and exocrine is imperative. That’s why most coding certificates and degrees include at least one medical terminology course. Medical coders must master this complex clinical language to properly assign their diagnostic and procedural codes. Employers also want staff who’re eager for lifelong learning to stay abreast of medical advancements. Even though medical coding isn’t a patient-facing role, being a skilled communicator is a must. Medical coders need to sharpen their speaking skills to effectively discuss patient records. On any given day, coders will interact with doctors, surgeons, nurses, medical billers, and front office staff. Employers look for communication skills to ensure important information isn’t lost in translation, especially with doctors’ notoriously bad handwriting. Nonverbal communication shouldn’t be underestimated either. Medical coders should be able to write memos and claims with good grammar for credibility. Since the American Recovery and Reinvestment Act was signed in 2009, healthcare facilities have been switching to electronic records to avert penalties. Medical coders and other HIT staff have been responsible for much of this transition. Employers rely on medical coding professionals to have the sophistic technology skills to run their digital patient databases effectively. Medical coders should be proficient at quickly learning new software from Microsoft Excel to Master Patient Index (MPI). 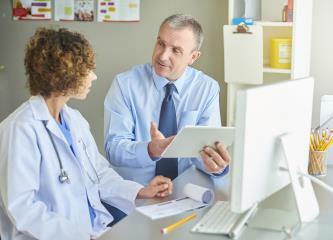 Computer-savvy coders stand out for ensuring EHRs produce the most precise patient data. Employers will question each medical coder’s moral character to determine whether they’ll abide by the profession’s strict ethical code. After all, coding staff handle confidential medical records protected by HIPAA every day. Medical coders need to show integrity in maintaining the privacy of every patient. Employers generally will ask for character references to help judge applicants’ ability to access sensitive data with discretion. It’s essential that medical coders treat records with anonymity, avoid conflicts of interest, and following coding standards to avoid punishable legal consequences. Medical coders are generally given great autonomy in handling their workload without direct management. A sizeable portion of medical coders telecommute from home offices where supervisors aren’t looking over their shoulders. Therefore, employers seek coding professionals with the drive and determination to stay on task independently. Medical coders must be able to proactively self-monitor the quantity and quality of work they’re completing. Coders should have the focus to avoid distractions like emails and social media. Staying motivated and productive without constant external feedback is critical. Job growth in medical coding is projected to explode by 22 percent through 2022. Skilled coders are needed to help transition to the more complex ICD-10 classification system. Productivity among current medical coders is expected to plummet by up to 70 percent with the ICD-10 switch. Employers are also struggling to fill their coding positions fast enough because having all of the above attributes is necessary. If you’re drawn to the fast-growing medical coding field, highlight these top qualities on your resume to impress employers. Adventurous, inquisitive medical coders, medical billers, and health informatics technology professionals can benefit greatly from pursuing international medical billing and coding jobs. While securing a stable paycheck, international coders and billers are able to see the world and immerse themselves in different cultures. Learning a new language and working in a diverse workplace help develop key skills for today’s healthcare industry. International job opportunities are booming because more health organizations are outsourcing their clinical documentation needs. Healthcare provider outsourcing grew by 31 percent from 2011 to 2016 according to the MGMA. Another perk to international contracts is higher income potential because cost of living is generally lower. Founded in1987, STARTEK Health is one of the world’s largest multi-national, medical staffing solutions company employing over 11,000 Brand Warriors globally. Based in Greenwood Village, Colorado, STARTEK has international locations in Jamaica, Canada, Honduras, and the Philippines. In 2014, the company won the CRM Excellence Award from Customer magazine for its IT-enabled services. International or remote jobs are available at STARTEK for medical coding, billing, and remote patient monitoring. According to Glassdoor, the average yearly salary with STARTEK Health is $32,430. Medical coding and billing positions will require holding CPC or RHIT credentials with at least two years of experience. Learn more about International Medical Billing and Coding Jobs at STARTEK Health here. Headquartered in South Africa, Global Medical Recruiting is a leading, privately held medical staffing company serving the Middle East since 2007. GM Recruiting specializes in placing Western expat professionals in healthcare facilities in Russia, Nigeria, Qatar, Saudi Arabia, and other countries. Currently, there are 160 job openings listed through Global Medical Recruiting for everything from biomedical engineering to podiatric medicine and dietetics. The Health Information Management (HIM) division has openings for certified coding specialists with three-year overseas contracts. Positions offer generous tax-free, Grade 112 salary with housing allowances and subsidized healthcare. Having two to three years of experience with ICD-10-CM coding is mandatory. Learn more about International Medical Billing and Coding Jobs at Global Medical Recruiting here. Valued at $2 billion, Parexel International Corporation is a premier multi-national, medical device and pharmaceutical firm employing around 18,600 workers worldwide. From its headquarters in Waltham, Massachusetts, Parexel runs offices in 51 countries, including China, Argentina, Turkey, and Finland. As a Gold Stevie Award winner, Parexel was named the 2015 Clinical Innovator of the Year. Parexel International Corporation hires HIT technicians, medical billing specialists, and clinical data analysts across the globe. On average, medical coding and billing jobs with Parexel earn $51,219 per year. Jobs in records management will prefer bachelor’s degrees, AAPC certifications, and 3+ years of experience. Learn more about International Medical Billing and Coding Jobs at Parexel International Corporations here. Operating 212 hospitals, Ramsay Health Care is a gigantic, global health organization located in Sydney, Australia, since 1964. With over 50,000 employees, Ramsay is among the world’s top five provide hospital operators. In 2012, Ramsay was honored with the prestigious Laing & Buisson Independent Healthcare Award of excellence. Medical coding and billing specialists can help process reimbursement for Ramsay’s over 2.5 million patients each year. International opportunities exist in Australia, France, United Kingdom, Malaysia, and Indonesia. Clinical coding jobs are frequently listed for medical staff completing associate HIMAA training and at least one year of experience. Hired coders access the Ramsay Employee Benefit Club. Learn more about International Medical Billing and Coding Jobs at Ramsay Health Care here. Serving over 1 million patients in British Columbia, Vancouver Coastal Health is a publicly funded, regional medical authority administering 13 hospitals and 15 community clinics. Since 2001, VCH has grown to staff 20,000 employees from the North Shore to the Sunshine Coast. The hospital operator has won two Gold Quill Awards of Excellence and a BC Patient Safety and Quality Award. Medical coding and billing professionals looking to work in Canada will find several job opportunities with VCH. Health record technician jobs typically pay $27 to $34 per hour with benefits and relocation assistance. Passing the Canadian HIMA exam with 2+ years of coding experience is preferred. Learn more about International Medical Billing and Coding Jobs at Vancouver Coastal Health here. Affiliated with the HBMA, Global Revenue Cycle Partners was established in 2011 as a multi-national healthcare outsourcing firm with revenue-generating services. The ANAB-accredited company is headquartered in Wilmington, Delaware, but has a global office in Bangalore, India. As a BPO market leader, Global Revenue Cycle Partners employs around 1,000 healthcare employees. Medical coders with six months to two years of coding experience are hired in America and overseas. Preference is given to coders specializing in radiology or emergency medicine. Executive AR positions are available for graduates with 3+ years in medical billing. The fastest-growing offshore medical billing company has hiring events multiple times yearly. Learn more about International Medical Billing and Coding Jobs at Global Revenue Cycle Partners here. Named among the “World’s Most Admired Companies” in Fortune, Robert Half International is a publicly traded, staffing firm located in Menlo Park, California, with 450+ global locations. Generating $5 billion in revenue, Robert Half has approximately 16,100 employees in various fields. Consulting magazine granted the company the Protiviti Award for Excellence in Social and Community Investment. The Healthcare IT Staffing division recruits medical coding and billing professionals for organizations like Allscripts and McKesson. Job opportunities span the globe from Singapore and New Zealand to Switzerland and Brazil. Certified medical coders with AAPC credentials and ICD-9 or CPT coding knowledge are in-demand. Full-time positions generally pay $20 to $25 per hour. Learn more about International Medical Billing and Coding Jobs at Robert Half International here. On the Forbes Global 2000 list, Cerner Corporation is a $19.8-billion dollar healthcare services company supplying information technology solutions to clinics worldwide. Based in Kansas City, Missouri, Cerner employs around 22,200 HIT professionals for revenue cycle management. Each year, clients of Cerner are selected for the elite Malcolm Baldridge National Quality Award and HIMSS Nicholas E. Davies Award. Cerner affiliates with over 14,000 facilities in diverse countries like Ireland, India, Egypt, Chile, and Malaysia. Cerner Corporation often hires medical coders and billers with ability to travel up to 80 percent. Holding an accredited associate degree with CPC certification and two to three years of experience is essential. Learn more about International Medical Billing and Coding Jobs at Cerner Corporation here. With over 28 years of experience, Med-X International Claims is a world-class, multi-national billing management company working with physicians and hospitals globally. In general, Med-X negotiates managed care contracts with 10 to 30 percent. Based in Matawan, New Jersey, the company has offices in Puerto Rico, Mexico, and the Dominican Republic. Med-X International Claims hires experienced medical coders, billing specialists, and billing coordinators. Having completed at least an associate degree and garnered CPC certification is required. High accuracy rates above 95 percent are preferred. Positions range from trainee to temporary and full-time. Salary, benefits, and travel allowances are competitive. Learn more about International Medical Billing and Coding Jobs at Med-x International Claims here. Founded in 2003, Promantra Synergy Solutions is a HIPAA compliant, revenue cycle management company that’s headquartered in Somerset, New Jersey, with a global office in Hyderabad. Their specialties include medical transcription, coding, billing, and claims recovery. Freshers and professionals are encouraged to join Promantra’s HIT team of over 500 employees. Currently, there are 12 medical coding positions open in Hyderabad for CCS and CPC certified candidates with at least three years of experience. Competency with Microsoft Office and ICD-9-CM coding is required. International salaries from Promantra average ₹15,000 per month. Shifts can be irregular because the company guarantees coding and billing services in under 25 hours. Learn more about International Medical Billing and Coding Jobs at Promantra Synergy Solutions here. Still looking for places to find international medical billing and coding jobs? Other excellent firms to consider are Kareo, CoreMedical Group, M*Modal, and AccuretRCM. What Are the Best Places to Find Travling Medical Coding and Billing Jobs? Medical billers and coders are responsible for translating details in patients’ records to insurance companies for gaining proper reimbursement. Every healthcare organization depends on medical coding and billing staff to remain profitable. Yet teaching hospitals are one of the leading employers of HIT professionals. In general, teaching hospitals are nonprofit medical centers affiliated with a university to train clinicians. They provide round-the-clock care in various specialties, from pediatrics to neurology and cardiac care. Interns and residents treat patients under close supervision from attending physicians. For medical coding and billing graduates, working for a teaching hospital can provide both rewards and challenges. Read on to learn five things you should know about medical billers and coders in teaching hospitals. The American Hospital Association reports that there are 5,627 registered U.S. hospitals total. Of these, 1,038 are teaching hospitals with high patient numbers. Some of the best are Yale-New Haven Hospital, NYU Langone Medical Center, and Johns Hopkins Hospital. Teaching hospitals employ more than 2.7 million healthcare professionals nationwide. It’s no surprise that medical billers and coders find less competition for jobs in teaching hospitals. After all, university-affiliated hospitals house 82 percent of the country’s ACS-designated Level I trauma centers. Teaching hospitals need large medical records management offices to protect inpatient and outpatient data. Medical coding and billing specialists can expect jobs in teaching hospitals to multiply because the field projects 10-year job growth at 15 percent. In comparison to several other healthcare settings, teaching hospitals grant above-average salaries to their medical billing and coding staff. According to the AAPC 2015 Salary Survey, medical billers and coders make $50,925 on average at inpatient teaching hospitals. That’s more than the $44,870 at mid-sized medical groups and $45,722 at independent physician offices. Teaching hospitals on the Pacific Coast from Hawaii to Washington report the highest medical coding and billing salaries nationwide at $57,021. Landing a job at a teaching hospital can considerably pad your paycheck, especially if overtime is offered. Due to their large size, teaching hospitals are also more likely to hire clinical coding directors with lucrative salaries. Teaching hospitals offer an academic-focused work environment where cutting-edge education and research is prioritized. Medical coding and billing jobs may require less post-graduation employment experience because on-the-job training is included. Teaching hospitals encourage staff to sharpen their skills with continuing education. For instance, Rush University Medical Center provides full-time employees with $5,000 in tuition assistance each year. This makes attending college online or during evenings more affordable. Medical coders and billers in teaching hospitals also join an active research community. Teaching hospitals receive approximately $2.2 billion in NIH research funding annually. Therefore, the HIM department will continually search for the latest tech advancements to streamline medical coding and billing. Being careful and attaining high accuracy is important for every medical coder. But those employed in teaching hospitals often have extra responsibility in checking over patient records. Teaching hospitals always experience new rotations of interns and residents who are unfamiliar with record protocols. New waves of med school students can mean patient records accessed by coders and billers are less orderly. One study found 10 percent reduced mortality risk at teaching hospitals, so they don’t compromise quality of care. However, clinical documentation can get muddled in the process. Teaching hospitals may hire experienced coders and billers to conduct medical auditing. Pursuing the AAPC’s Certified Professional Medical Auditor (CPMA) credential would come in handy here. Teaching hospitals typically charge more for medical services because they treat higher acuity patients with complex conditions. Funds are also included for the hospital’s research and academic instruction. For example, George Washington University Hospital charges $69,000 on average for lower joint replacement. Sibley Memorial Hospital, a nearby community hospital, charged under $30,000 in comparison. Medical coders and billers must be prepared to figure the dollar signs with higher hospital rates. Considerable time will be devoted to coding for diagnostic tests because teaching hospitals order 7.1 percent more tests than their non-academic counterparts. Medical billing specialists should be aware that teaching hospitals are largely urban and accommodate vast numbers of Medicaid or uninsured patients. One of the biggest perks to entering the medical coding and billing field is the possibility of telecommuting from the comfort of home. Billers and coders are able to access medical records via secure Internet connections to work from virtually anywhere. Finding remote positions can be ideal for maximizing family time while lowering commuting costs and stress. Whether the job is part-time, full-time, or per diem, medical coding and billing specialists can make good money from a home office. According to PayScale, the average annual salary is $35,374. Many companies are expanding their workforce with certified coders and billers, but remain cautious of scams out there. Consider the following 10 Best Places to Find Work From Home Medical Coding and Bill Jobs from reputable companies who often list work from home medical coding and billing jobs. Located in Gardena, California, Maxim Health Information Services belongs to one of the largest medical staffing companies in the United States. Since 2001, MHIS has worked with the country’s healthcare facilities to improve electronic patient records with outsourcing solutions. The Better Business Bureau has given Maxim HealthCare Services an A+ rating. Short-term and long-term remote medical coding jobs are available with ICD-10 training. Employees at Maxim Health Information Services receive competitive pay and full benefits, including dental and 401(k). There’s even room for advancement into medical coding supervisor positions. Check out Maxim Health Infomation Services’ Remote Medical Billing and Coding Jobs here. Ranked on the Fortune 500 list, Humana is a giant health insurance corporation headquartered in Louisville, Kentucky, with over 13.8 million medical members. It’s estimated that at least 10 percent of Humana’s 49,000 associates telecommute from home. According to Computerworld, Humana is among the “100 Best Places to Work” in America. The company also scored a perfect 100 on the Human Rights Campaign’s Corporate Equality Index. Remote medical coding and billing jobs are frequently posted for candidates with CPC or CCS-P credentials. Humana also hires virtual coding educators who have five or more years of experience. Check out Humana’s Remote Medical Billing and Coding Jobs here. Aviacode is a popular medical coding and billing contracting firm in Salt Lake City that employs around 850 certified medical coders remotely nationwide. Founded in 1999, Aviacode has been named among Utah’s 50 fastest-growing companies. The company serves approximately 8,800 physicians across 61 medical specialties. Aviacode boasts that they’ve generated over $50 million in medical coding revenue. Work from home positions hire 1099 independent contractors for 15 to 40+ hours per week. For hire, Aviacode requires candidates to pass the ICD-10 Proficiency Assessment through the AAPC. Check out Aviacode’s Medical Billing and Coding Jobs here. Partnered with nearly 4,000 healthcare facilities, Precyse Solutions is a leading clinical data management company based in Roswell, Georgia, since 1998. Some notable clients include Fairmont General Hospital and UMass Memorial Medical Center. Precyse Solutions has been awarded the HIMSS Gold Corporate Member Award. Precyse’s Coding Team consists of approximately 375 certified medical coders living in 41 states. For positions, applicants must have AHIMA credentials and two years of work experience. Each hired coder will receive full orientation and free online training from Precyse University to learn the integrated PrecyseCode platform. Check out Precyse Solutions’ Medical Billing and Coding Jobs here. For the past 30 years, Medical Record Associates LLC has grown into one of America’s largest health information services organizations. Based in Quincy, Massachusetts, MRA contracts with around 500 employees nationwide to provide full-suite HIM solutions. Flexible, remote jobs are available for medical coding and cancer registry. MRA serves hospitals, clinics, physician offices, and other healthcare providers who outsource their HIM department. Medical Record Associates offers work from home employees well-rounded benefits, including paid holidays. To apply, candidates must have RHIT or CPC credentials with a 95 percent accuracy rate. Check out Medical Record Associates’ Medical Billing and Coding Jobs here. Altegra Health is a privately held, national company that provides end-to-end reimbursement solutions. Based in Weston, Florida, Altegra Health has over 25 years of experience partnering with diverse healthcare providers in all 50 states and Puerto Rico. Affiliated with the AHIMA, this reputable company has over 5,000 employees both on-site and from home. There are current hiring opportunities for remote certified coders who have at least one years’ experience applying ICD-9-CM codes. Altegra Health pays remote coding professionals by the chart and follows strict QA standards. Specialties are offered, such as oncology and behavioral health. Check out Altegra Health’s Medical Billing and Coding Jobs here. Based in Frisco, Texas, Conifer Health Solutions is a successful health information services firm with over 30 years of experience and 800+ medical clients. Conifer’s 14,500 team members aim to provide value-based solutions that drive clinical and financial performance. It’s estimated that their services process over $29 billion net revenue annually. Conifer Health Solutions debuted at #66 on Forbes’ list of “America’s Best Employers” in 2016. Coders are currently being hired for work from home opportunities with competitive $3,000 sign-on bonuses. Jobs for billing specialists and cancer registry consultants with at least two years of experience are also open. Check out Conifer Health Solutions’ Medical Billing and Coding Jobs here. Established in 1981, LexiCode is a high-quality coding and billing consulting service that’s a subsidiary of SourceHOV. From its headquarters in Columbia, South Carolina, LexiCode employs around 300 HIM professionals with benefits packages. In 2014, the company was declared a “Best in Category Leader” by KLAS Enterprises LLC. LexiCode has previously advertised $10,000 sign-on bonuses for inpatient and outpatient surgery coders. Full-time and part-time remote jobs are frequently available, but applicants must hold RHIT or CPC certification. Holding a two-year associate degree will fulfill the experience requirements. LexiCode declares a special mission to employ military veterans too. Check out Lexicode’s Medical Billing and Coding Jobs here. Anthelio Healthcare Solutions is a large healthcare technology company in Dallas, Texas, that provides revenue cycle management services for over 63,000 physicians. Anthelio supports annual revenue above $67 billion for over 60 million patients. The business’s 16-year dedication to excellence lead to being ranked #1 for HIM outsourcing solutions by Black Book. Anthelio Healthcare Solutions’ cutting-edge technology was also featured on FOX Business. Medical coders and billers can find remote HIM processing jobs. Anthelio generally only requires three months of relevant experience, but active CTR or CPC credential is necessary. Check out Anthelio Healthcare Solutions’ Medical Billing and Coding Jobs here. The Coding Network only hires remote, independent contractors to provide HIPAA-approved coding solutions across 55 physician specialties. Since its founding in 1995 by Mark Babst and Neal Green, TCN has grow to over 650 coders working across the United States. Based in Beverly Hills, California, The Coding Network is affiliated with the Healthcare Billing & Management Association (HBMA). More than 500,000 charts are coded by TCN staff each month! To apply for telecommuting work, candidates must be AAPC or AHIMA certified with 3+ years of experience. Passing a specialty coding proficiency exam is part of the hiring process. Check out The Coding Network’s Medical Billing and Coding Jobs here. Medical coding and billing jobs are increasingly popular for individuals seeking entry into an in-demand healthcare industry. Medical coders use ICD or CPT codes to translate patients’ diagnoses, tests, and treatments into numerical digits for reimbursement processing. Medical billers review this information to file insurance claims and collect payments from the carrier. Both jobs are essential for keeping healthcare organizations profitably paid for their medical services rendered. But are medical coding and billing specialists paid handsomely too? On average, medical coding and billing jobs bestow an annual salary of $40,430. This is equivalent to a mean hourly wage of $19.44. Different job titles in this diverse field provide varying income levels though. According to Salary.com, the average base salary for medical billing clerks in the United States is $34,121. Medical coders reap mean annual salaries of $38,463. .Medical records coding technicians can expect an average salary of $48,909. The salary range for medical coding and billing goes from $24,190 to $61,400 and up. Let’s explore how important factors like work setting, state, and education can affect salary. Collecting a healthy salary in medical coding and billing can depend on which healthcare organizations you apply to. The AAPC shows that workplace size plays a pivotal role in determining the dollar signs on your paycheck. Coders and billers employed at mid-sized practices with 11 to 49 physicians earn the lowest at $44,870 on average. Solo and small group practices with under 10 doctors give average yearly salaries at $45,722. Larger hospitals provide sizeable average income jumps to $47,773 (outpatient) and $50,925 (inpatient). Multi-site health networks gift the biggest average earnings at $51,389 per year. Medical coding and billing positions can see pay increases or decreases based on type of healthcare facility also. The Bureau of Labor Statistics reports that ambulance services offer an average annual wage at $28,930. Skilled nursing facilities have below-average income potential at $37,550. However, medical coders and billers in specialty hospitals reap a mean salary of $43,060. Jobs with the federal executive branch grant $47,520 on average. Medical coding and billing specialists working for dentist offices bring home a mean yearly salary of $41,430. T hose who teach college students in academia have a high mean wage at $45,210. How much you’ll make as a medical coder or biller will vary greatly based on where you live and practice. Salary averages by location show that the top-paying place in the United States for medical coding and billing is the District of Columbia. Jobs here earn an annual mean wage of $69,290! Following behind Washington, DC, are New Jersey, Alaska, and California where the average salary for medical coders and billers is $60,310, $52,040, and $48,590 respectively. States in the South typically have the lowest income level. For instance, medical coding and billing professionals in Louisiana make just $32,390 on average. Medical coders and billers can find increased earning potential in certain cities too. In 2015, the top-paying metropolitan area was Newark, New Jersey, with an annual mean salary of $66,710. A close second went to San Jose-Santa Clara where coding and billing specialists earned an average income of $62,270. Other high-paying metros were Oakland, San Francisco, and Silver Spring at $58,830, $55,480, and $54,740 respectively. On the other end of the spectrum, some metropolitan areas have little room for salary growth. For example, medical coding and billing jobs in Davenport, Iowa, deliver an mean wage of $29,380. Paying college tuition for a degree or certificate in medical coding and billing will prove fruitful. Employees with no college education typically start in the bottom 10th percentile with income under $29,130. The AAPC proves that studying pays off because coders and billers with an associate degree earned an average of $46,815. Technicians who had a four-year bachelor’s on their resume unlocked a mean salary of $54,552. Having higher education will also prepare you for assuming more advanced titles. For instance, those who assume leadership responsibility as medical billing managers earn $84,096 on average! Coders and billers with past years of experience in the fast-paced healthcare arena are rewarded with higher salaries. Starting salary for trained medical coding and billing specialists with zero to one year of experience is around $32,000. After you get five to nine years under your belt, salary hikes to over $42,500 on average. Professionals with more than 15 years of coding and billing experience make a mean of $56,667 annually. From there, salary usually increases by 5 percent for every five years of additional experience. Medical coding and billing workers who take the extra effort to earn certification from the American Association of Professional Coders are rewarded with above-average salaries. The AAPC 2015 Salary Survey found that that certified members averaged a 2.6 percent pay increase. Certified Professional Coders (CPCs) obtain a mean wage of $51,454 each year. Certified Outpatient Coding (COC) specialists make a mean yearly salary of $58,822. The highest income average belongs to Certified Physician Practice Managers (CPPM) who bring home $64,666 per year. Having two AAPC credentials sparks a median salary of $58,399. Investing your time into building a medical coding and billing career can pay off in spades in today’s market. It’s predicted that the healthcare sector will require more coders and billing specialists to organize a surplus of patient data. Increased medical demand will ignite faster-than-average job growth by 15 percent for over 29,000 new jobs through 2024. The AAPC also reports that unemployment rates have decreased by 0.5 percent for certified members in the last 12 months. Now that you’re more aware of salary comparisons in medical coding and billing, you can maximize your earnings in this rewarding healthcare profession.